Whilst the Contemporary Art Society is principally known for buying artists early in their career, we are acutely aware that decades of funding pressures have left gaps in collections across the country. Future generations will find it inexplicable that through a period of unprecedented international acclaim for artists working in Britain, so many of our public collections have been unable to collect examples of their work. Once a year, through the Great Works scheme that has been established with the support of the Sfumato Foundation, the Contemporary Art Society will attempt to address this situation. 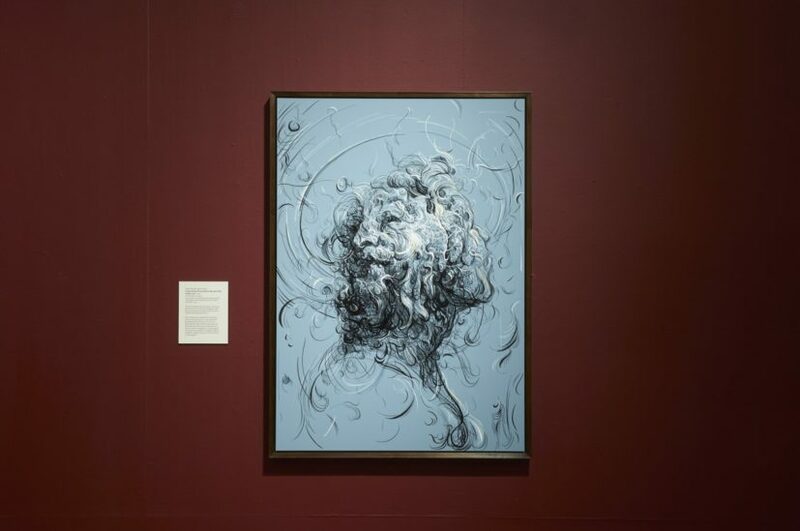 This year, a work by the internationally acclaimed artist Glenn Brown has been donated to the Laing Art Gallery in Newcastle upon Tyne. Brown was associated with the generation of artists known as the YBAs (Young British Artists), who came to prominence in the late 1980s, and showed with them in a number of exhibitions that came to define the period. 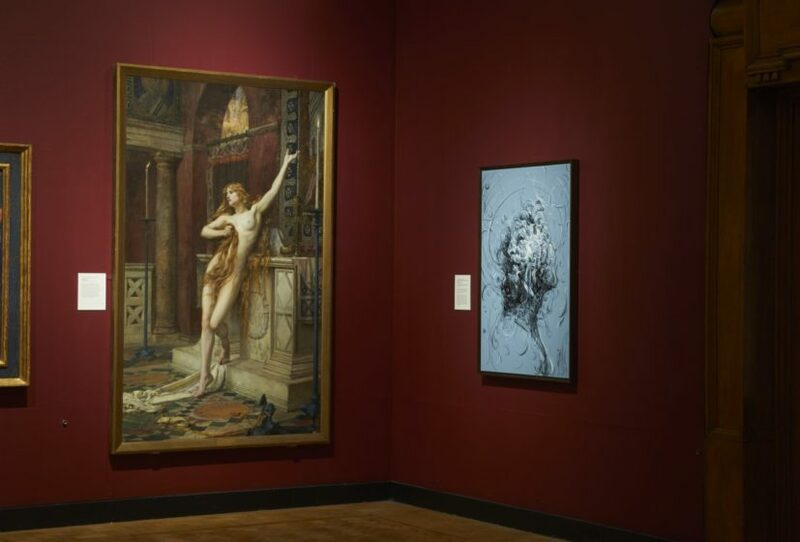 Since that time Brown’s work has been shown and collected by some of the most prestigious institutions worldwide, and yet none had found their way in to a museum collection in the UK. It is also thanks in large part to the great generosity of the artist that we are able to respond to the Laing Art Gallery’s desire to make this inaugural acquisition of a work by Brown. In the end we all succumb to the pull of the molten core (2016) was made especially for the Laing in Newcastle, and is recognisable as part of a new body of work that the artist has embarked on since 2014. Famous for his appropriation and manipulation of old master paintings, Brown has developed a new group of works that instead borrow their subject matter from renaissance drawings. The grey ground of the painting references the coloured paper favoured by artists of the period, and his black ink and white acrylic media mimic the ink with chalk highlights that were typically employed in sketches and preparatory works. In this instance Brown has combined drawings of the head of an old man by Giovanni Domenico Tiepolo and that of a young man by Andrea del Sarto. The faces emerge from a gaseous swirl of almost calligraphic lines, the heads melded together as the young man looks forward to the future and the bearded elder looks back to the past with occluded eyes. The accumulation of marks would suggest a plasticity to the surface, but as with his earlier paintings, the hermetic smoothness of the finish denies any probing of the picture plane. While Brown’s paintings are emphatically handmade, the conjuring of protean form from an inchoate swarm gestures to very contemporary forms of digital animation. 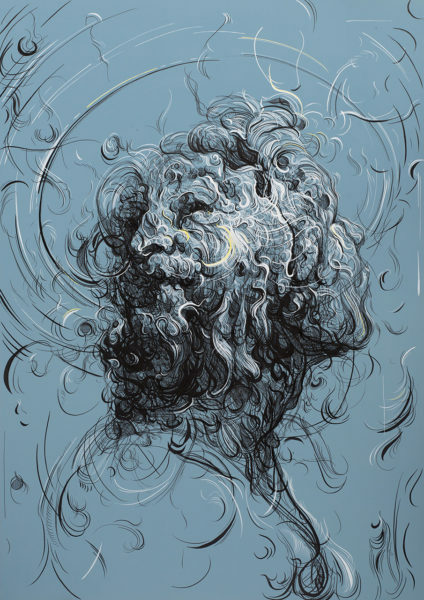 Glenn Brown (b. 1966, Hexham, Northumberland, UK) lives and works in London and Suffolk. He studied at the Norwich School of Art, Bath College of Higher Education, and Goldsmiths College, University of London. His work has been the subject of numerous solo exhibitions including Rembrandthuis, Amsterdam, the Netherlands (2017); Fondation Vincent van Gogh, Arles, France (2016); Frans Hals Museum, Haarlem, the Netherlands (2013-14); and Tate Liverpool, Liverpool (2009). His work has also been part of various group exhibitions, including Centre Georges Pompidou, Paris, France (2013); Kunsthalle Vienna, Vienna, Austria (2011); and the Venice Biennale, Italian Pavilion (2003).